Do you want to know how blood circulation works or what an aneurysm is or how it causes heartburn? If so, illustrator Henning Riediger from Hamburg is your man! He started using Copytrack’s services in our early years and his specialty is creating realistic medical illustrations. His pictures clearly show how our body looks from the inside, how the different systems work and how they affect us. With visual support, bodily functions can be perfectly visualized and oftentimes using graphics is even better than using photos. 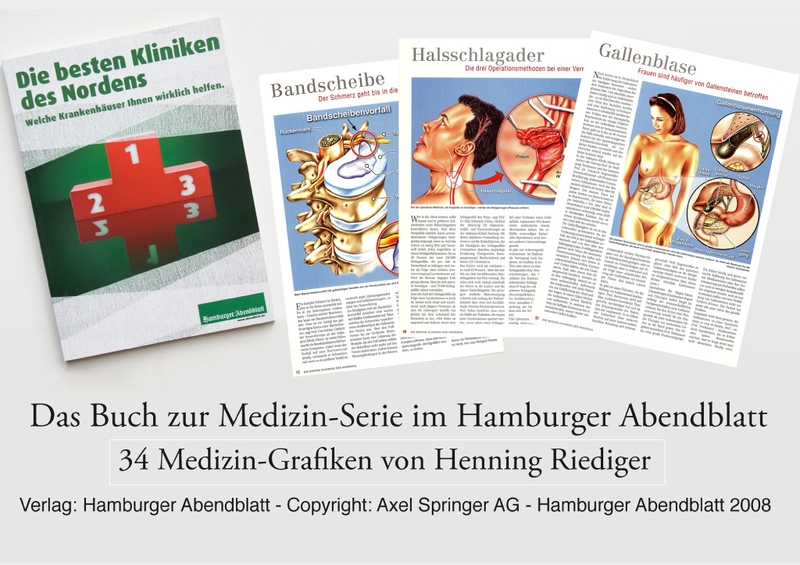 In the last ten years, Henning Riediger has built up an extensive archive of detailed anatomical graphics, which he makes available to his customers online. 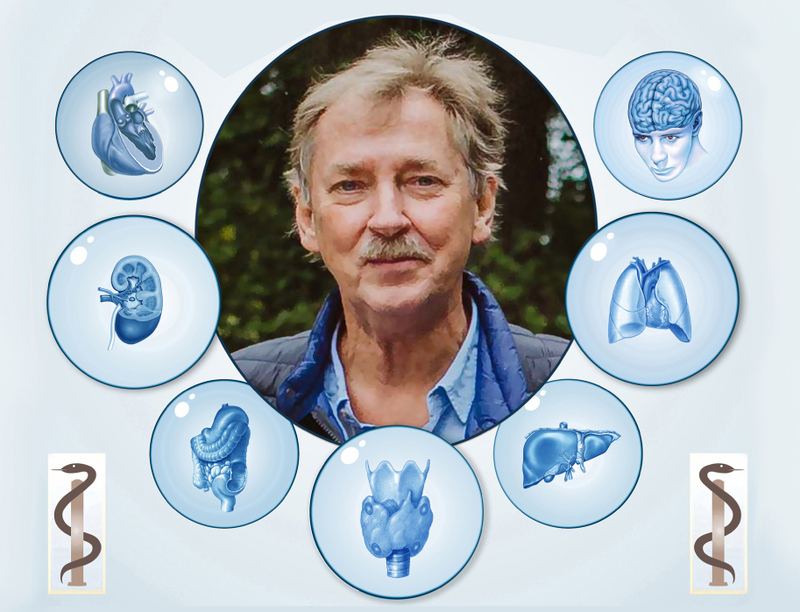 We asked the experienced illustrator why he became so fascinated by the topic of medicine, what he wanted to give young colleagues along the way and what experiences he has made with copyright infringement. Becoming a medical illustrator is not the most common of career choices; how did you decide on making this your profession? At the age of 16 or 17, I had a vision that I would end up doing something with performing arts and painting. I’m also biased due to my grandfather, who had worked in the field of art education as a secondary school counselor in Hamburg. In addition, my brother, who unfortunately died at the age of 49, was a contemporary artist who was very renowned for his northern German landscape paintings. Many originals from him still hang on Sylt, in Benediktenhof in Kampen. His work definitely influenced me in my early years. After graduation, I was pretty sure I wanted to study something with art so I went to Design College for four years. I majored in communication design with a focus on nonfiction and children’s book illustration. During my studies, I started to accepted my first work assignments on the side. At that time, I began to pursue my own acquisition and make pencil drawings for short stories in fashion magazines such as Brigitte, Für Sie und Freundin, which came out very well. This marked my first forays into the media landscape. How did you continue after graduation? For the next year after my graduation I worked in a very well-known gallery in Hamburg where my brother always had big exhibitions, the Commeter at the Rathausmarkt. That was my entry into the art scene, and the owner of the gallery was very accommodating. She would say: "Mr. Riediger, don’t you want to do something for the gallery yourself?" I then designed shades of color, scratched copper plates with a metal rod and printed the recesses in black on a printing machine on paper - these were called etchings. They actually did relatively well as a matter of fact. My motifs were North German landscapes and houses. At the same time, I worked as a DJ in a then well-known Hamburg nightclub in Poppenbüttel. Those were exciting times for me. My pictures at Commeter also began to get noticed by other galleries because I had been on the map for so long and had sold graphics locally or gave them away as commissioned goods. This allowed me to take my first steps into the world of art. Later, a letterpress publisher from Hamburg approached me and asked me if I also wanted to work with normal stationery. Another company wanted calendars with farms in Germany and the publisher had the idea that I illustrate children’s books. That's when I landed a banger in 1983 - the "Hasenmärchenbuch aus dem Welt" - which sold 11,000 copies in less than three months. Neither me nor anybody else saw that coming! How did you move into photorealistic illustrations? When my wife and I gave birth to my daughter, I needed more financial security and started to explore how I could get it. I taught myself airbrushing and began making my work more and more realistic. Around that time I had a four-week stay in California with a friend and drove the entire route 66. In the US I found many museums and exhibitions with this exact hyperrealism style. It was so realistic that at times it was hard to know whether you were looking at photos, illustrations or paintings. That was very impressive to me. When I came back from California, the well-known Documenta took place in Kassel. At that time the topic was: realism in art. There I discovered some role models and thought, "Wow, I want to be able to do that someday." Eventually income from my landscape motifs and etchings started to slow down and many gallery owners began wanting to buy work on commission only. This was way too risky for me. All of the driving I had done in the United States had inspired me, so I took my portfolio to the lion’s den, the two largest publishers in Hamburg, Heinrich Bauer and Axel Springer. It was at that time that the photo editorial at Bild am Sonntag invited me for a cup of coffee and we proceeded to talked for over two hours. When I left, I had secured two colored double pages in their editorial! All I could think was, "Pinch me! This can’t be real!" What were you commissioned to do for Bild am Sonntag? 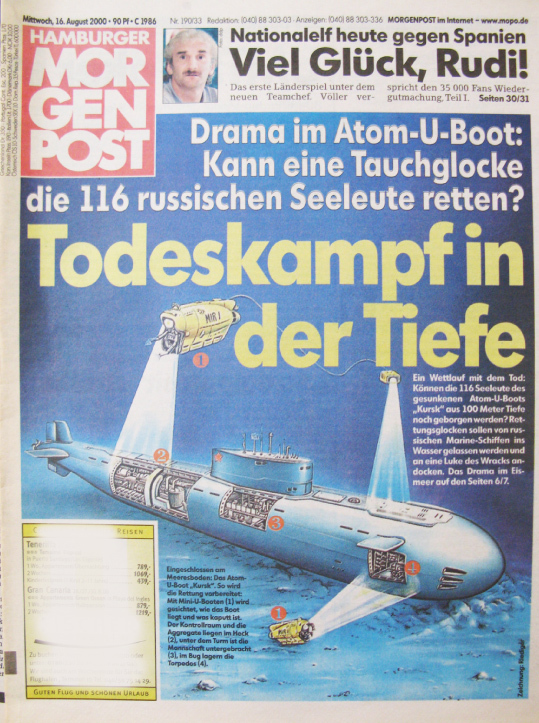 Commissioned work for Axel Springer/ Bild am Sonntag, subsequently also published on the title of Hamburger Morgenpost. The first of these orders was a Russian submarine that had sunk off the Norwegian coast. They had discovered that there were still radioactive reactors on board and I was commissioned to create a completely factual and detailed illustration. I didn’t know how I was going to do it, but I had 10 days to figure it out. Bild am Sonntag were so excited by the result that the illustration appeared in two different versions nationwide. By the next week my phone was ringing not stop - everyone wanted to buy this motif. Next they requested a summer topic on melatonin formation in the pituitary gland under sunlight, so I said, "Sure, why not?" Was that the moment that marked the start of your career as a medical illustrator? Yes, exactly. 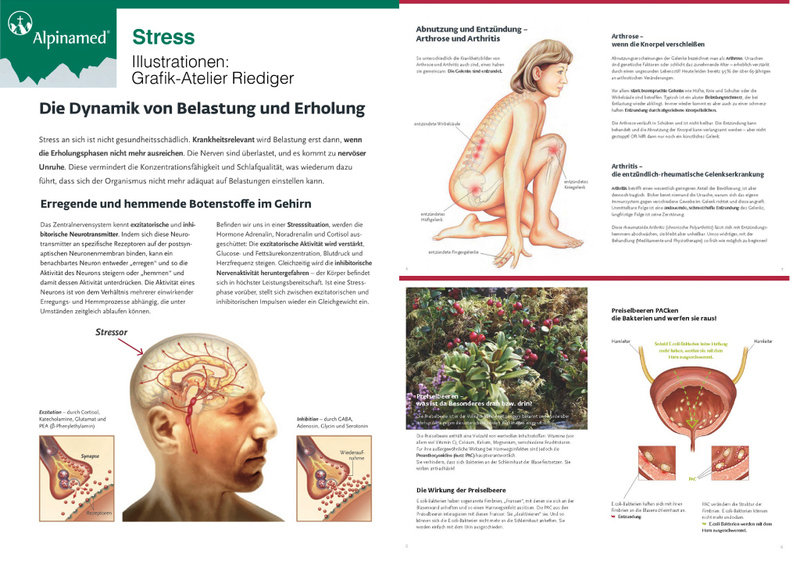 I got all the necessary information from an Eppendorf medical bookstore and delivered an illustration to Bild am Sonntag. My illustration was of a woman climbing out of the water with all her organs showing. I then illustrated in which order they react to the sun and what exactly happens in the body at that time. This was illustrated so big that they had no idea how to scan it all. In the end they had to go to a specialist company to copy the picture. I started making the graphics a bit smaller afterwards but that was just the tip of the iceberg. Next came the Heinrich Bauer Verlag and the Neue Revue. They had a good medical page and the boss asked me, "What do you think about using Photoshop and computers?" That was in 1995, when the first generations of Macs were beginning to hit the market. A good friend of mine at the time was working at one of the top ad agencies and he said to me, "Hey, I’ve got a big Mac screen I can sell you!" It was 21 inches, which at the time was gigantic. I ended up buying it and my friend only sold it to me for 4000 marks! After experimenting with it for a bit, I realized that it appealed to me. How did you get started with digitization? There were courses everywhere that I could have participated in, but I'm not a course type of guy, I always try to learn things myself. After I taught myself Photoshop I realized, "Wow, my possibilities have been redefined completely!” I started archiving everything. At that time everything was still on discs and CDs so I simply burned my work onto CDs and sent them to the editors - for free. It was great and it was a real win-win situation, they worked with my illustrations from the CD and were able to edit them directly. This of course made the job extremely convenient. I also benefited from the fact that in the 90’s editors were in the trend of making the right medical magazines which led to me receiving an order from a Yellow Press magazine. 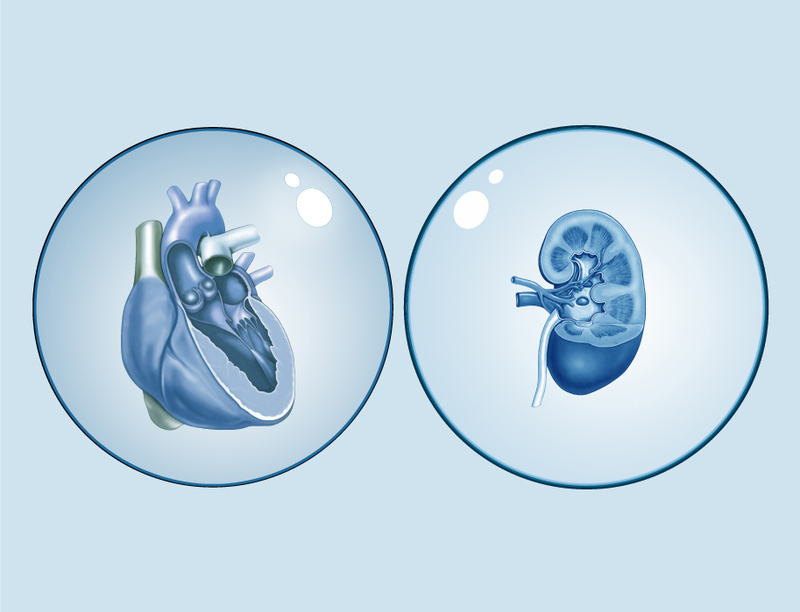 They started to have me focus on medicine - heart and lung illustrations in particular - and this series never stopped. At some point they said, "You can do this for us for the next three to four years, every week." Of course, this motivated me immensely because, on the one hand it gave me a lot of financial security and on the other hand spurred me on to try more things. The illustration requests started to become very detailed. They were about all forms of diabetes and the development of liver cirrhosis. Of course, I had to get started right away so I began stockpiling books. I basically became a physician without ever studying to be one in the traditional sense! Are you not afraid that your material will be stolen, why are you putting it on the internet? You have been in the business for a long time. Do you have any tips for young aspiring illustrators? My colleagues always asked me, "How can you burn something onto a CD and send it? Are you not afraid that your material will be stolen? Why are you putting it all on the internet? "What I wanted to say was, how is anyone supposed to know what I can do if no one ever sees? I have to risk that some things might fall through the cracks. To me, this was less of a risk than not doing it that way and risking not ever being known at all. At that time it was also possible to walk directly into large advertising agencies in Hamburg with a folder of work and present it to them. This is unfortunately not the case today; you can’t do quite as well in the way of getting an appointment at an editorial office with nothing more than a folder under your arm these days - they just don’t have time for that. That being said, I would strongly suggest to scatter your material around freely if it’s something exceptionally good, and do try to find a way to be at the editorial offices in person. Do your research first and then go out in person or reach out to prospects via email. Be aware, however, that emails are usually too impersonal and are easy to get lost among the sea of other emails being sent to their inbox all day long. This brings me to my next suggestion, advertise yourself! Whether you're good at programming or not, you can still set up a website - it's not as difficult as it used to be. In my opinion, quality ALWAYS prevails if you are offering something special or something new. Many people are beginning to leverage YouTube and other social media platforms to post their work. For example, I discovered that a very young colleague of mine has had huge success advertising his "house wall painting" service on Facebook. This is quite a unique service he’s offering and the main thing he does is promote it via Facebook. He said that doing so never fails to bring him follow-up orders. When people ask him about his hourly rate, he always tells them, "It doesn't exist. The price depends on the quality and duration of the order.” It has reminded me that that's how I myself started. It’s something that repeats itself - using the media to advertise yourself. When was the first time you found a copyright infringement on your work? One day a friend of mine told me to search myself on Google images. I almost fell out of my seat when I laid eyes on what I found there. Often times I came to the conclusion that these uses were legal, however, in some cases I realized that there were also many that I didn’t authorize at all. After researching what I could do about the situation, I discovered that Copytrack was providing a service for this very purpose - that was just over two years ago. I thought that it sounded like a great service so I decided to create a folder with cases that I wanted to pursue to pass on to Copytrack to take care of. Half a year later I stumbled upon even more infringements, but it was still too much trouble for me. Then in February 2017, I thought to myself, "So, now you have to go through everything again from scratch." I was overjoyed by Copytrack and had everything registered two days later. I got a really good introduction to the website from a nice Copytrack employee - he was so lovely, helped so much and gave me tips on what to do. In the first half of the year after I registered I won about 30 cases from copyright infringement alone - just like that! How do you find working with our system? I am very satisfied with the way the system works, it’s wonderful and easy to use overall. It’s also understandable that sometimes things may get backlogged and I have had cases that have spent seven or eight months being processed. The good thing, however, is that I can always reach out and get personal feedback if needed, which I really appreciate. I have also been reassured that nothing is ever lost. Cases that have to be sent to lawyers just take time, as one could expect. To put it simply, the whole copyright infringement process with copytrack is quite relaxed - all I have to do is just check my profile from time to time.